So perhaps fewer people in the UK are religious these days, but while people might choose to get married in a registrar’s office rather than a church, not many would want their nuptials presided over by a robot. In Japan, of course, it’s different. 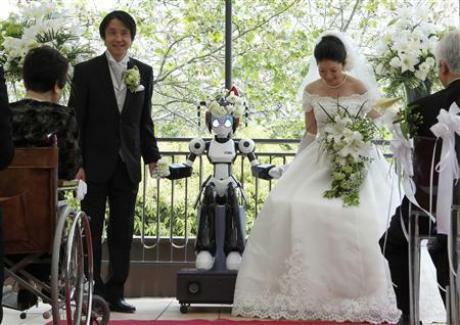 A couple in Tokyo were married by a four-foot tall robot over the weekend. Called the iFairy the little bot is one of a range of intelligent talking robots that usually take guided tours of museums. The couple’s decision to take vows from a robot was prompted by the fact that the couple met through robots. The bride, Inoue, works for the company that makes the i-Fairy, and her husband, Shibata, is a client. Inoue is obviously proud of her company – Kokora – product and just wants to show how versatile this chatty robot is. After taking the wedding the bride told Japanese media that she wanted to use her wedding to show people that robots can easily fit into their daily lives. 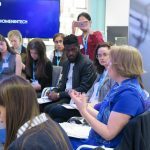 “I always felt that robots would become more integrated into people’s everyday lives. This cute robot is part of my company, I decided that I would love to have it at my ceremony,” Inoue said. Well, it just adds one more alternative to the myriad different number of ways people could get married. This beats getting married under water any time!